Jupiter will reign as king of the night sky on Sunday (Jan. 5), visible all night long as it reaches opposition. This means that, in Earth's sky, Jupiter will stand exactly opposite the sun. As the sun sets in the west, Jupiter will rise in the east. Jupiter sets in the west just as the sun is rising in the east. Jupiter reaches opposition with the Sun on Sunday, Jan. 5, 2014 surrounded by a ring of bright stars. You can see a live webcast Jupiter at opposition online Sunday, courtesy of the online skywatching website Slooh. 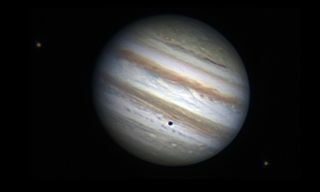 The all-night webcast will begin at 5 p.m. EST (2200 GMT) and feature views of Jupiter from the Prescott Observatory in Arizona. With the naked eye, Jupiter will be the brightest object in the sky other than the moon, since Venus sets less than an hour after the sun. At magnitude -2.7 on the upside-down brightness scale astronomers use, Jupiter will outshine all of the bright circle of winter stars which surround it. Jupiter will be three times brighter than Sirius, the brightest star in the sky, at magnitude a -1.4. With binoculars and a steady hand, you should be able to spot one or more of Jupiter's four brightest moons: Io, Europa, Ganymede, and Callisto. These are easy targets for even the smallest telescope. Editor's note: If you snap an amazing photo of Jupiter that you'd like to share for a possible story or image gallery, send pictures, comments and other details to managing editor Tariq Malik at spacephotos@space.com. It is fun to follow in Galileo's footsteps and watch these four moons as they dance around Jupiter, shifting positions from night to night. Sometimes they pass in front of Jupiter, casting their shadows on his face; at other times they disappear behind Jupiter or into his mighty shadow. More powerful telescopes reveal a wealth of detail in the tops of Jupiter's clouds. Jupiter's rapid rotation forces these clouds into distinct horizontal bands, easily visible in telescopes of at least 3 inches (75mm) aperture. Embedded in one of these cloud belts is a gigantic oval storm. This has been followed for centuries by astronomers, who call it the Great Red Spot. Being a storm in Jupiter's upper atmosphere, the Great Red Spot drifts back and forth in longitude, while staying more or less at the same latitude. It varies in its color and darkness, but right now it is a particularly intense orange color according to Canadian astronomer Alan Whitman. Because Jupiter is above the horizon for about 15 hours this month, we have a rare opportunity to observe a complete rotation of the planet, which takes slightly less than 10 hours. For example, on Tuesday night, Jan. 7, observers in eastern North America can see the Red Spot at 6 p.m. in the evening local time, and again, one full Jupiter day later, at 4 a.m. in the morning.